The baby shower word scramble game is the perfect way to liven up guests! 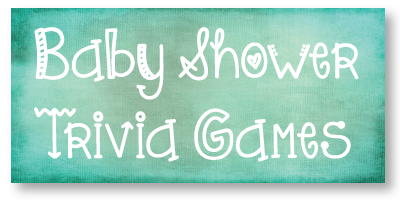 The "Baby Shower Word Scramble" is a popular and classic game that dates back to the inception of baby showers! Guests will be racing to see who can unscramble the baby-related words the fastest! Playing simple and low key baby shower games is a wonderful way to make guests loosen up and feel at home. Some great words to use are diaper, blanket, crib, bottle, pacifier, socks, stroller, etc. Mix up the letters of each baby related word and type them out using Microsoft Word or any writing software. You can even add cute baby shower clip art to the game page to jazz it up a bit. Hand out a game sheet to each person - along with a pen and a hard surface such as magazine. Set a timer or use your watch and give guests 2 minutes to unscramble as many words as they can. The guest(s) with the most correct at the end of 2 minutes is the winner. If you have more than one winner (which is likely), you can have them pick a number between 1-20 and the closest person to your number wins. Or you can reward all of the winners with baby shower prizes! Planning a baby shower is a huge task and sometimes you find yourself in a time crunch to get everything done. 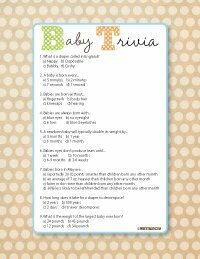 If you are short on time and don't want to make your own baby shower games, don't worry, we've gotcha covered! Print from home or take to your favorite print shop such as Staples, Office Depot, UPS, FedEx Office, etc. We recommend printing on white cardstock or white laser paper. Print as many copies of each game as you need! 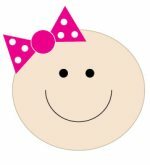 We work hard to provide our readers with quality baby shower printables. All of our designs are for personal use only and cannot be resold, shared or given away. These are digital products - no physical product will be sent. Write or type out 5-8 baby related words onto a piece of paper. Repeat each word for as many people as you expect to have at the baby shower. (For example, if you were expecting 10 people, you would type out PACIFIER 10 times - large enough so each letter could be cut out separately) - Do this for each word. Print and cut out all of the letters, keeping them organized by words. Put each cut up word into its own little baggy. Be sure to scramble the letters up so they are not in order in the bag. This should give you 5-8 baggies of words for each guest. Hand the bags out and have the guests unscramble all of their words and arrange them in order. The first person done wins a prize!